Goosey Gander Glampers. Where will you wander? Up north, down south, hopefully not into a lady's chamber! Gertrude is ready to follow wherever you go. And she will make sure you are very comfortable whenever you decide to stop, explore and rest. Mechanical brakes. No need for an electric controller. No need for a big car as most standard cars can tow Gertrude! She has a 12 pin plug fitted; we can provide 7 pin flat or round adaptors. Please note, the pick up and drop off times are by mutual agreement (not as listed on this web site). Generally, anytime between 8am and 8pm is fine by me. Chemical toilet, basic camp shower and ensuite tent available if required. Toilet must be returned clean and empty. 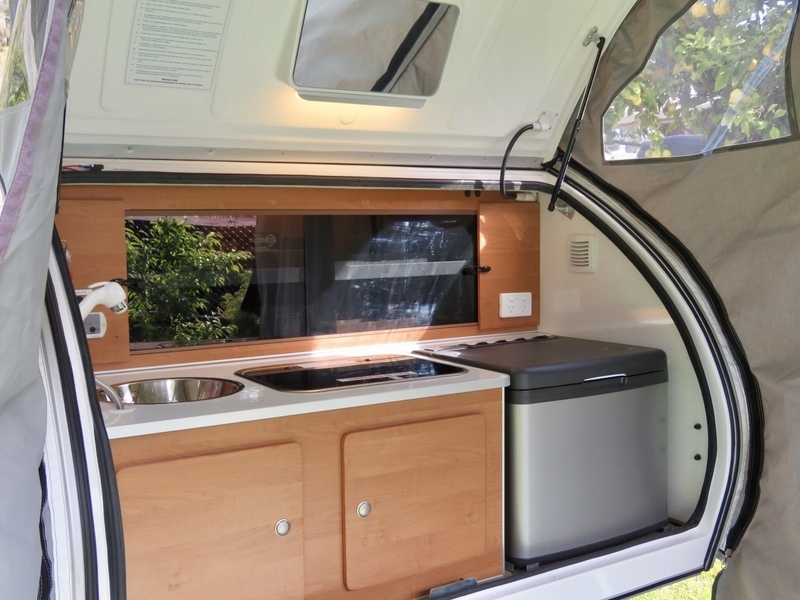 Love camping, hate the set up and pack away? Introducing Gertrude. She's your hotel room on wheels. Easy set up (no canvas to struggle with); just stop and make yourself a cuppa or hop straight into bed! 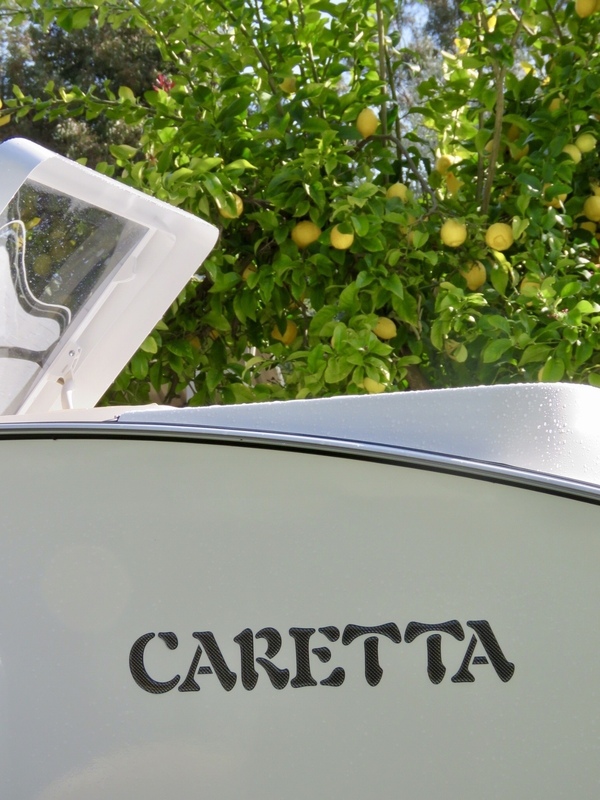 She's light and nimble, easy to reverse and manoeuvre, pretty much anyone can tow her. Easy on your fuel so environmentally friendly. Solar powered lights, TV, fridge and water pump. Very comfortable queen sized bed, with good quality linen included (mattress protector, sheets, doona, pillows and towels). 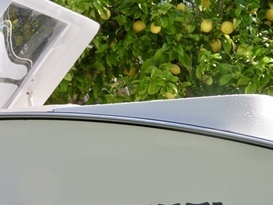 Panoramic roof vent (with flyscreen and privacy blind) so you can watch the stars. Door windows (with fly screens and privacy blind) for ventilation. TV with ability to connect a laptop/ipad etc to watch movies. Radio with ability to connect your own device to play your own music. Fully equipped and stocked kitchen (crockery, cutlery, cooking utensils, tea, coffee, condiments etc) with sink, 2 burner gas stove and fridge. Easy to erect kitchen annexe (if required). Folding table, 2x camping chairs and gazebo provided. Little extras to make your holiday heaps of fun included. 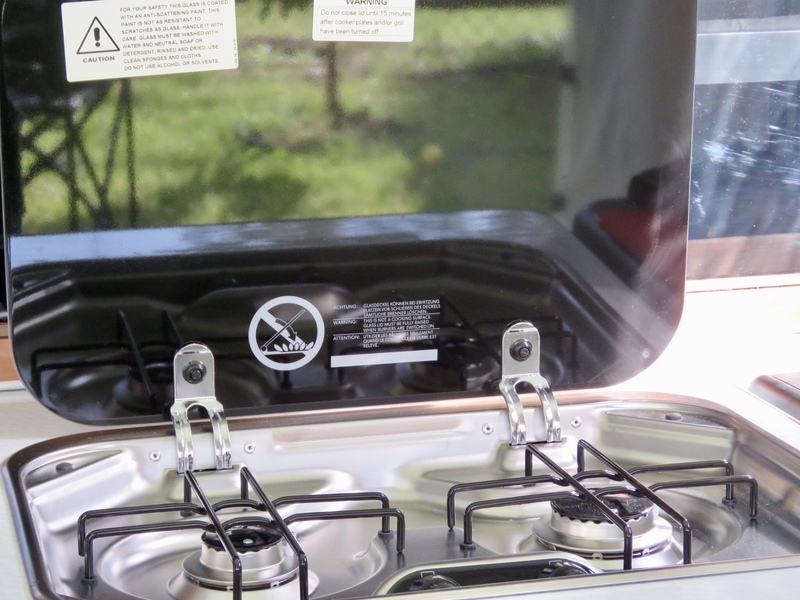 Extra camping equipment available if you have children or extra adults traveling with you or if you wish to cook over a campfire. You bring your clothes and toiletries, we provide everything else. Hook her up and off you go! The easiest way to camp. Pets allowed, but please make sure they have clean paws before hopping into bed! Hirers must be 25+ years old. No off road/4WD use considered. 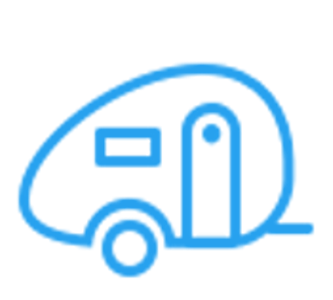 The camper will be provided clean inside and out prior to hire, please ensure it is returned in the same condition otherwise a cleaning fee of $100 will apply. Additional items are available for hire including a tent for those extra big and little wanderers, campfire equipment and utensils-camp oven, campfire tripod, jaffle makers etc. Minimum 2 night hire, except during school holidays when a 7 night minimum hire period will apply. Gertrude was fantastic. So easy to tow and set up. Really comfortable inside, spotlessly clean with lovely linen and blankets. Kristine is a wonderful host who goes above and beyond, supplies everything you need and much more, nothing is too much trouble. Would highly recommend, such an easy way to camp. Great little camper.Easy setup,everything you need has been provided for.Comfortable warm bed for those cold Albany nights.Thanks Kris for all the little extra touches & treats. Well stocked, easy to tow. Had everything we required to just hitch and go thanks to the wonderful service provided by Kristine. Gertrudes owner. I was blown away at the level of service from Kristine. Great communication and she genuinely cared about our trip. She sent me ideas and links of places to visit and camp. Gertrude was a delight. Although a tiny van, I could compare it to a tiny house that seems to be a minimalist trend nowadays. This delicious little van had a nook for everything. We had reservations about its tiny size, so tried it out for a weekend trip. It was comfortable, cozy, airy and clean. At no time did we feel short on space. Easy to tow and if you have trouble with reversing trailers or vans, no problem, just unhitch and push Into the perfect spot. Gertrude was well equipped with the basic pantry items, and snacks. All you need to take is your clothes and toiletries. Plus food if your cooking meals in the kitchen. I could go on and on about all its features. I dont think we got to really discover all the hidden features and hidden storage spots. We took Gertrude the Glamper away for the weekend She behaved herself beautifully. Stocked with some yummy snacks, in beautiful condition, and a lovely bed she was a pleasure to take away and towed very lightly. Friends admired her thought she was cute but very convenient and comfy. We used solar power all weekend and it worked well. Gerty is a gem, weve just had one of our greatest holidays. So easy to set up, Kristine has thought of everything to make it a simple and wonderful experience. All you need to do is pack clothes and toiletries & youre set to see AUS in the greatest way, thanks to Kristine! I cannot recommend Gerty enough. What a great first experence at camping. Kristine the owner goes above and beyond to provide all the basics including a bottle of wine cheese and crackers. A surprise in every cupboard. What an absolutely fantastic trip! The van was great and easy to tow, and the owner, Kristine, was so generous. She had everything as stated and all we needed in the van, and then more. It went as smooth as it possibly could and we will be sure to use Gertrude again for all of our glamping needs. I couldn't recommend her highly enough. Easy to deal with, great communication and the perfect choice for our weekend away! 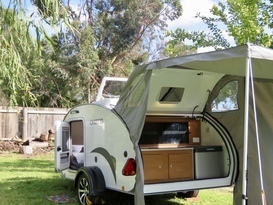 Have always wanted to try a tear drop camper as seems like the perfect solution for compact camping and travelling. My experience with Gertrude certainly cemented this view and was pleasantly pleased with everything she offered. The whole experience with camplify ( my first time) and organising with Kristine was fantastic. Gertrude was perfectly set up for us when we picked her up and had everything we needed for our trip. Would certainly use Gertrude again and recommend others to give it a go! An absolutely amazing experience. 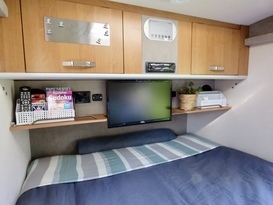 Very comfortable and well stocked with supplies and entertainment. The tear drop camper was perfect for our little getaway. We wanted something simple, easy to set up, and easy to pack up and go. Gertrude was a pleasure on all fronts. Kristine was also a pleasure to deal with. Always eager to help, and very responsive. Was very easy to tow and the owner was very easy to deal with. Had the BEST stay with Gertrude for a couple of nights camping.So easy to tow and very easy set up. Gertrude comes with so many extras,we ended up leaving a lot of things at home! We were the hit of thr caravan park with nothing else around thats anything like Gertrude. We have an amazing getaway in Gertrude, the getaway was made stress free by the wonderful owners they were extremely understanding and accommodating with a last minute change. 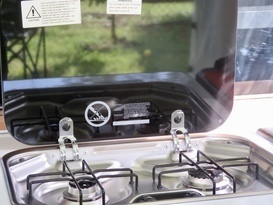 The little camper is perfect and stocked with anything you need, everything has been thought of. We wish we could use her again at Christmas but shes alreday booked. 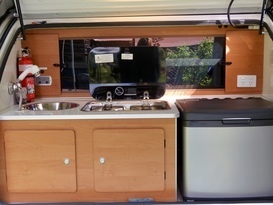 What a fantastic little camper , Gertrude is stocked with everything you will need for a luxury camping trip. 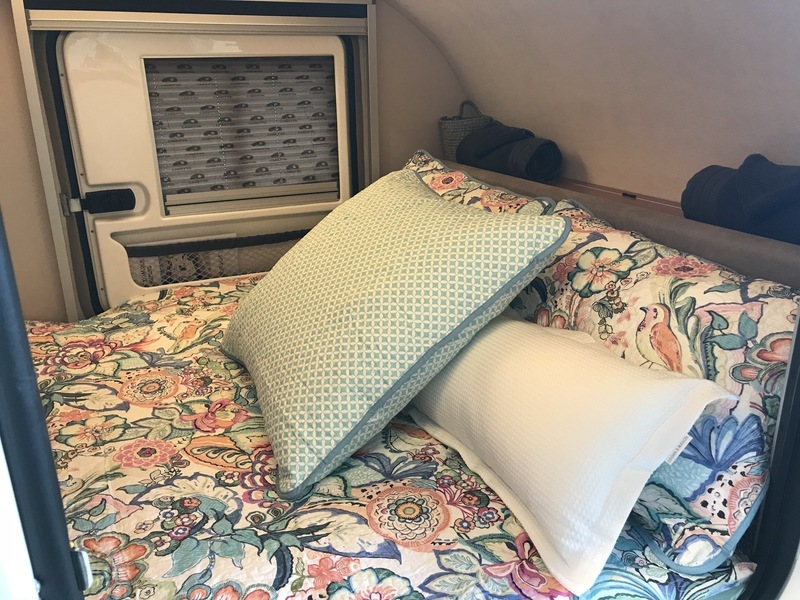 She has a comfortable bed that provided me with the best sleep I have experienced in years, she is well ventilated with a roof skylight and windows with fly screens. 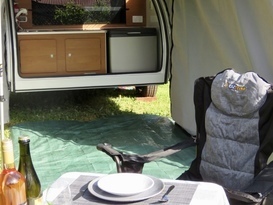 A very easy van to tow which makes camping pleasurable. 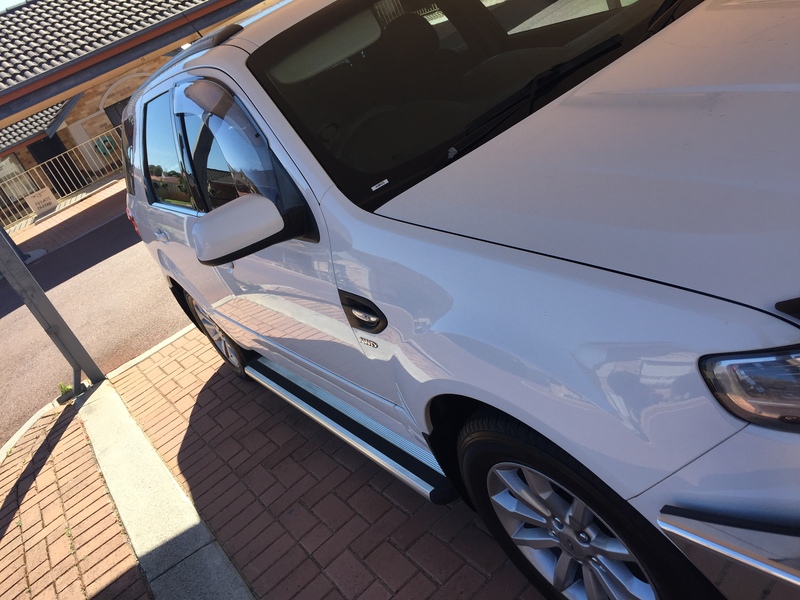 Kristin was a pleasure to deal with and stocked Gertrude with little extras including wine,cheese, chocolate etc she has managed to provide everything you could possibly want, plus more. At the end of the trip there was very little to unpack put away as Kristine had provided it all including bed linen,towels, cooking equipment which takes away the hard work of camping. I will definitely be hiring Gertrude again. We absolutely loved Gertrude the Glamper. She is tiny, but cosy and very comfortable. Easy to tow, no fuss set up and pack away was a dream. Kristine spoiled us with a vast variety of snacks and drinks. Everything we could possibly need was there for our convenience. The bedding is top quality, towels provided too. So many gorgeous pillows and cushions as well. We would highly recommend Gertrude, It was a fun experience. Be prepared for lots of interest in her cuteness. Thanks Kristine and Andrew. We had a fabulous time. We loved our time with Gerty! 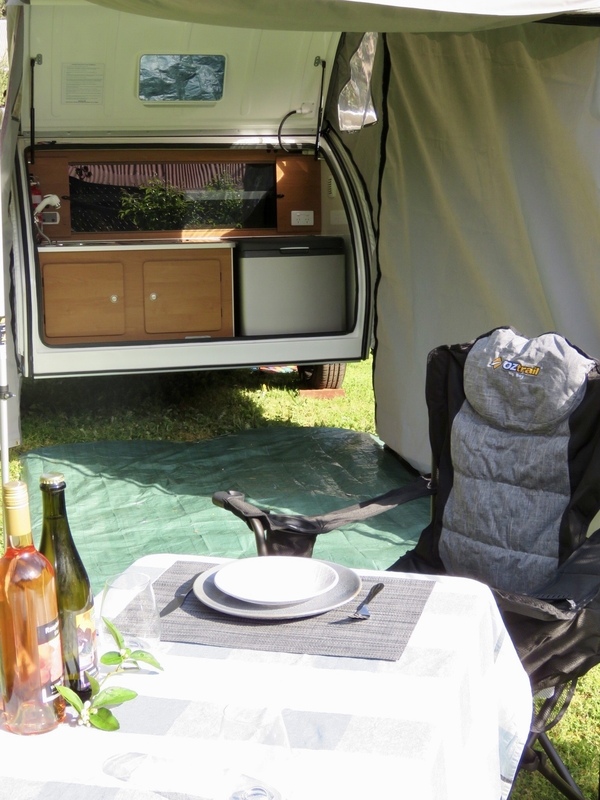 This is camping made easy with a touch of luxury. The added bonuses of a Tv with chrome box, radio, solar power, fully functioning kitchen with gas and water plus a queen size bed was just bliss. We took our kids along with us ages 1 and 6 and recommend not taking kids unless there is other sleeping arrangements for them. All and all my kids loved Gerty and hanging out inside. . We appreciate Kristine and Andrew lending their Gerty, until we meet again ¿ thank you. Gertrude was a fantastic hire. I've been looking at teardrop campers for a while, and hiring for a couple of days was a great dipping my toe in the water. 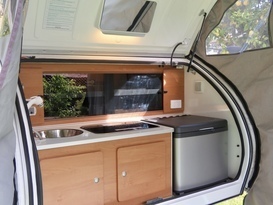 The camper has everything you could need and more, for a fantastic camping experience. Extremely easy to tow, both forwards and backwards. Very comfortable to sleep in, and the kitchen area has all you could need for a great meal. The two nights I hired her for was some of the best sleep I've had in ages (and the middle of the day nap was great too). If like me you're looking to make the next step up from being in a tent, but don't feel the need to tow an entire McMansion house behind you, this is a great way to go. I certainly look forward to my next hiring of Gertrude the Glamper. I was hoping for a good couple of days away, but what I got was an outstandingly excellent experience. Fantastic camper such alittle gem. Brand new stocked with everything you will need and extra goodies. Very easy to tow and use. Will def use again and recommend. Kristine was great to deal with and very helpful. Wife, mother, midwife, travel addicted!